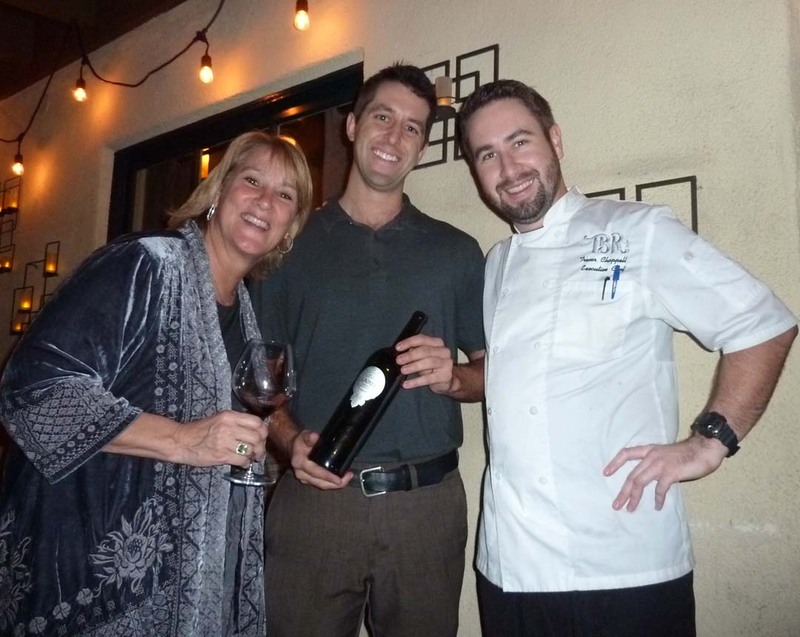 It’s customer first for the many happy guests who have discovered all there is to know about The Barrel Room in Rancho Bernardo, a vintage wine bar and bistro that is raising the bar skyward with some grand plans for the future. They started the year our right by bringing in the legendary Laird Family Estate from Napa Valley. The last time I saw Rebecca Laird, she was holding court in Del Mar at a dinner years ago. She hasn’t aged a bit, but her wines have. Laird wines are simply in great demand, especially from other wineries. Confusing you say? Not really. After founding Laird in 1970 by buying 200 acres, her father Ken Laird and his wife enlisted the help of the one and only Robert Mondavi. He mentored them to specialize in Cabernet Sauvignon, Merlot and Chardonnay. The first few years, they did 3,000 cases, and in the boom in production in the valley that followed, wineries were coming to them to buy all the grapes they could produce. I asked her about all the rain this season and the affect on the grapes. She wound up the presentation at The Barrel Room with a vertical flight of three years’ worth of her Jillian’s Blend of Cab, Merlot, Syrah and Petite Verdot: 2011, 2012 and 2013. My vote went to the 2013, a carefully prepared vintage with subtle, elegantly mixed grapes. Most of the rest of the room thought so too. I didn’t know a lot about the Barrel Room until I witnessed the professionalism and the fun of the Laird wine dinner. The team has worked hard to make it a retail wine shop, a wine bar, full casual dining restaurant, and I would add, a source of memorable wine dinners. 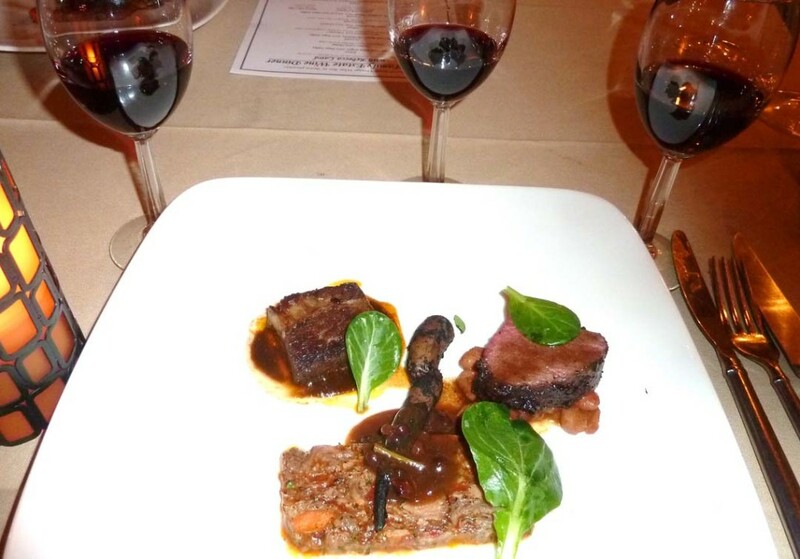 To match the Laird offering of a three-vintage vertical tasting of their most popular blend, The Barrel Room came up with three connected entrees: an Oxtail Terrine, an Espresso Elk Striploin and a Braised Rib. The next extraordinary wine dinner is scheduled for March 21 at 6 p.m. It’s a 90-plus point Argentina Wine Dinner with Marcos Mizzau, a wine expert from the country. He will showcase the diversity of Malbec, the signature wine from Argentina. Cost is $75 per guest. Reserve a spot by calling (858) 673-7512. I sat down with General Manager Brett Preston, who enthusiastically revealed plans for an expansion into Carmel Valley soon. He also confirmed that all of their 250-plus wines at The Barrel Room are also sold for guests that want to buy them for take home purchase, at a discounted price. The Barrel Room is in The Plaza, off Bernardo Center Drive, just east of Interstate 15. Find out more at TBRSD.com. Meritage Wine Market in Encinitas is having a flavorful lineup of top Pinot Noirs for its next Friday evening tasting March 17 from 6 to 8 p.m. Pinots from Napa, Sonoma and other great growing grounds will be poured. Cost is $30 per person; $20 for Club M members. On March 23 from 6:30 to 8:30 p.m., Meritage presents a Continuum and RAEN wine dinner with Tim and Dante Mondavi from Napa Valley, in the Private Cellar Room at the wine shop; $175. RSVP for both events at (760) 479-2500. Truly Fine Wine on Morena Boulevard in San Diego is having a “component” wine tasting March 18 with two tastings: at 11 a.m. and another at 2 p.m. Cost is $10. From “peppery to buttery,” it will be examined and explained in the tastings. Call (858) 270-9463. The 7th annual Agua Caliente Palm Desert Food & Wine event will take place March 24 to March 26 at the Gardens on El Paseo. Celebrity chefs from across the country display their culinary skills, with lots of wine and beer tasting. Over 40 restaurants will participate in the Grand Tasting from noon to 4 p.m. Prices vary. The VIP tickets for attendance from 11 a.m. to 4 p.m. go for $135 each. Visit palmdesertfoodandwine.com for details to each day’s activities. Friday Night Live at the Winery kicks off at Thornton Winery in Temecula, March 31 from 6 to 9 p.m. with a Journey Tribute concert. The place will rock with live music, dancing, and great wine and food with a specially prepared menu. Cover charge of $10. For an RSVP, call (951) 699-0099. Frank Mangio is a renowned wine connoisseur certified by Wine Spectator. He is one of the leading wine commentators on the web. View his columns a tasteofwinetv.com and reach him at mangiompc@aol.com.